A recognition of achievement based upon nomination by someone within DeMolay, without the nominee’s knowledge of consideration. 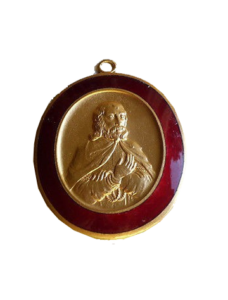 Designed by Dad Land, the Legion of Honor is the highest honor conferred by DeMolay International. DeMolay International may confer the DeMolay Legion of Honor upon a Senior DeMolay, who has attained the age of twenty-five years for outstanding leadership in some field of endeavor, or for success in fraternal life, including adult service to the Order. No one may apply for this distinction, and a nominee, or the membership of a Chapter, must have no knowledge of the recommendation by the Advisory Council. Failure to observe secrecy in making this nomination subjects the nominee to penalty of not being considered. DeMolay International may confer the DeMolay Honorary Legion of Honor upon a Mason who is not a Senior DeMolay, who has attained the age of thirty years as of the first day of the annual meeting of the year nominated, and who has performed unusual and meritorious service on behalf of the Order or who has evidenced a spirit of cooperation and appreciation for the Order. It shall not be given only for service on an Advisory Council. 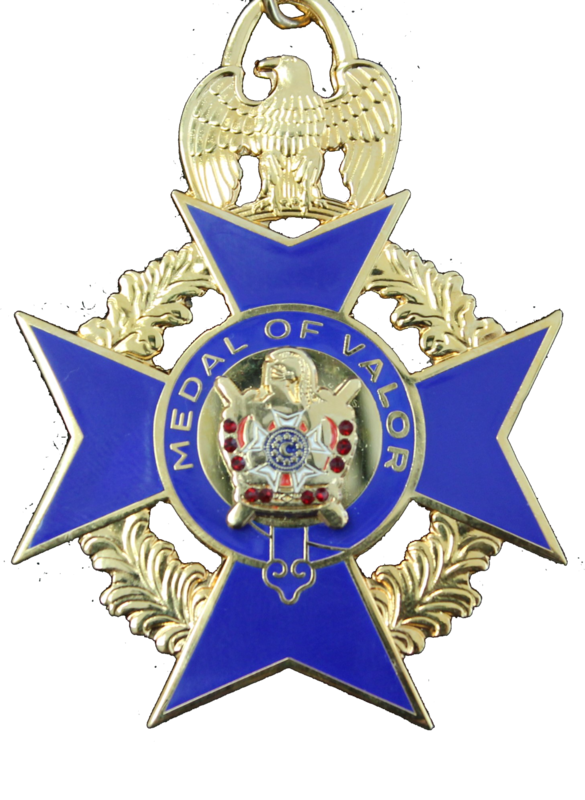 DeMolay International may issue the Medal of Valor to an individual who while an Active DeMolay has performed an act of saving or attempting to save a human life. 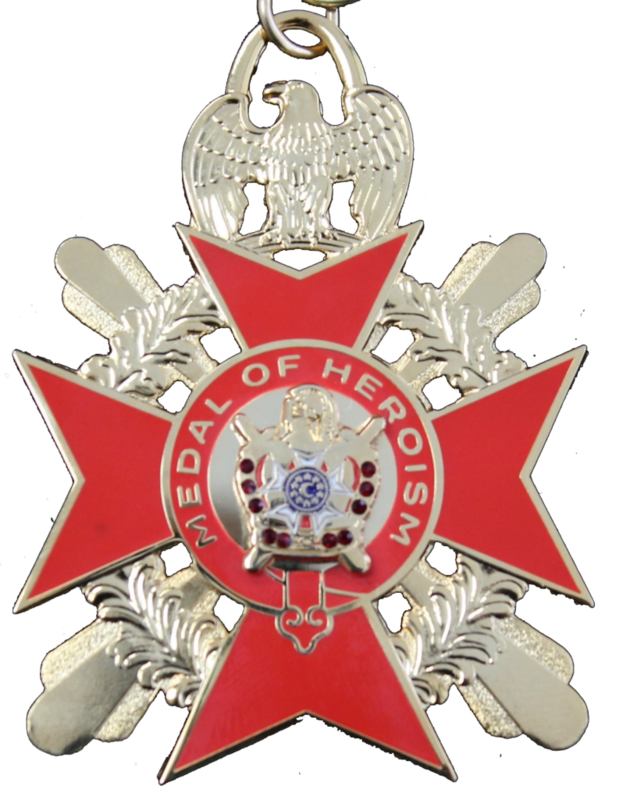 DeMolay International may award the DeMolay Medal of Heroism to an individual who, while an Active member of the Order of DeMolay, voluntarily risked his own life, or voluntarily performed an act of heroism in saving or attempting to save the life of a fellow human being, or sacrificed himself in a heroic manner for the benefit of another. An achievement to be worked toward, a goal or a recognition to be earned. Membership awards are given for securing new DeMolay initiates. DeMolay International grants these awards automatically. 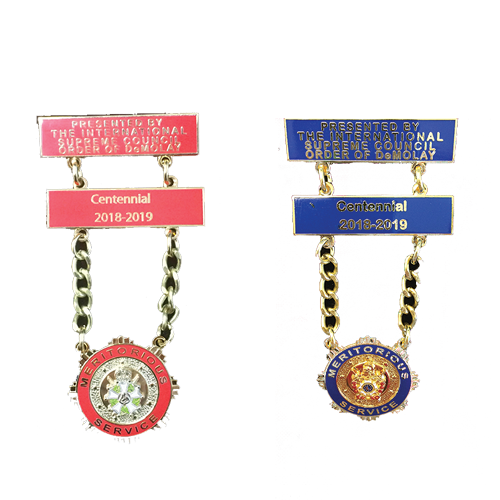 First-line signers may claim the same new members to earn the #1 Lapel Pin, Founder’s Membership Award and Blue Honor Key. It’s exciting to sign up your first new member. The #1 lapel pin recognizes this important achievement. The Blue Honor Key is awarded to an Active or Senior DeMolay for being the first-line signer for 10 new members initiated by a Chapter. These 10 membership applications do not have to be secured for any one class or in any one year. An active member who secures fewer than 10 applications before he reaches his majority may complete the requirements list after he reaches majority. Additional Blue Honor Keys, with stars to designate each multiple of 10 new members secured, are also granted. The Green Honor Key is awarded to a Knight for being the first line signer on 10 applications that are accepted by the Priory. These 10 applications need not be secured for any one class or any one year. The Green Honor Key is awarded only to an active member of a Priory or to a Senior Knight who holds a Senior DeMolay certificate. A member of the Priory, who secures fewer than 10 applications before he reaches his majority -provided he holds a Senior DeMolay certificate- may complete the requirements. Additional stars can be added to the Green Honor Key representing each multiple of 10 new members secured, providing that the proper request is submitted. The Green Honor Key is awarded by the Supreme Council without charge and nomination blanks may be secured from the DeMolay Service and Leadership Center. These awards are earned by a conscious effort to meet their requirements. The Leadership Correspondence Course is a five-course program testing your knowledge of DeMolay. The Lamp of Knowledge certificate is awarded for successful completion of the first course. The Representative DeMolay Award is the highest self-achievement award Active and Senior DeMolays can earn. It’s a self-assessment program where you progress towards goals you set for yourself. You complete a detailed survey of your interests, achievements, general knowledge, and habits. 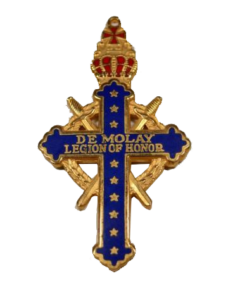 The Representative DeMolay program was first established in 1924, and for many years was a competition to select outstanding DeMolays. In 1935, the program was redesigned to fill a growing need for self-evaluation by every DeMolay. Dad Land said it was his dream that every DeMolay should be a Representative DeMolay. 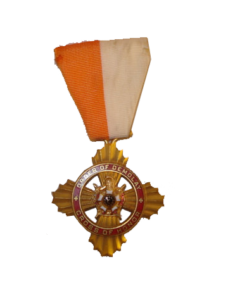 Merit Bars primarily are awards that recognize DeMolays for achievement in some phase of Chapter activity or in their personal lives while members of DeMolay. Merit Bars are awarded to individual members on the recommendation of the Awards Advisor. The Advisory Council makes a final decision about whether an individual has met the requirements for each bar. Each Merit Bar is produced in five colors. Each color designates the number of times a DeMolay has received a bar in that category. The color designations in order are: White, Red, Blue, Purple, Gold The categories in which Merit Bars are awarded through DeMolay International are Athletics, Attendance, Civic Service, Conclave, Correspondence Course, Fine Art, Fund Raising, Installing, Journalism, Masonic Attendance, Masonic Service, Membership, Merit, Priory, Religion, Ritual, Scholastic, and Visitation. The Past Master Councilor’s Meritorious Service Award (PMC-MSA) was designed by Dad Land primarily to stimulate greater over-all efficiency in local Chapter Operations. The Past Illustrious Knight Commander’s Meritorious Service Award (IKC-MSA) is the only award for service within the Priory. Awards given in appreciation of exceptional DeMolay service. A Certificate of Appreciation may be given at any time during the year. These certificates are available from the Store, which completes the certificate, attaches a seal and sends it to the Chapter for presentation. A formal presentation should be planned and all DeMolay parents and volunteers invited. Upon the recommendation of the chapter advisor, a DeMolay who serves efficiently as a Chapter officer may obtain a Service Certificate. The Certificate designates the office held, the term, the year, and the name of the Chapter. A Chapter may recommend any person over 21 years of age for the DeMolay Medal of Appreciation in recognition of outstanding service to DeMolay. The nominee can be a man or a woman and does not need any Masonic affiliation. Nominations may be made at any time. Pin and Certificate given to commemorate reaching 10, 25, 50, 60 65, 70, 75 years past initiation. DeMolay International established the Distinguished Service Award in fall of 1959. In some jurisdictions, the award is known as the “DeMolay of the Year” award. The purpose of the award is to recognize one DeMolay in each jurisdiction for outstanding service to others, in his home, school, church, Chapter community and country. The Chapter’s Advisory Council members select one or more members of the Chapter whom they believe worthy of the recognition. Adult leaders in the community are asked to evaluate the nominee’s performance in various areas.